Anyone visiting Amsterdam must definitely visit this place. The National Monument of Dam Square marks a significant and important phase of Netherland’s history. Established in 1956, it bespeaks of the terrifying times of the World War II and is dedicated to its victims. It was beautifully created by Dutch architect J. J. P. Oud and draws a lot of visitors, especially historians, from all around the world. The twenty-two-meter high monument is greatly symbolic, depicting the essence of misery, fearlessness, loyalty, patriotism and liberation that is connected with the uprising and aftermath of the war. If you wish to know more about the city’s history and how the war has affected it, you will get a lot of insights just by visiting this place here, hence ensure to come! It's one of the best focal points to start any tour. I did it as a teenager, with my new wife and now as a father of 3 and every time, I start here to any tour. The hotel is right next door and the shopping street connects you from the new to the old part of the town. Stayed here for a good 20 minutes while waiting for a friend and I was able to record via time lapse how fast the weather in Amsterdam changes. It's in the center of the business district and a great place for meeting friends. 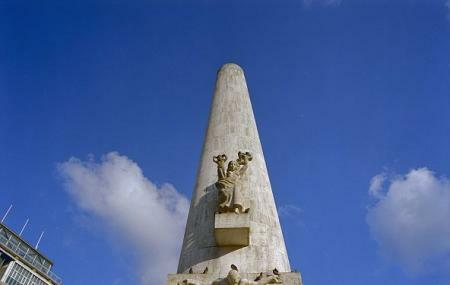 The monument is very impressive and sits on the opposite side of the road from Dam square (which is one of the most cosmopolitan squares in Europe). It is situated at the end of Warmoesstraat which is one of the entrances to the red light district. Generally the monument is covered in tourists who are meeting up or eating and that is because it is such a perfect central meeting point. The free tours of Amsterdam mostly set off from here so it is also perfect for taking those. Located opposite Dam square very heavily populated with tourist. It's a must visit if you are in Amsterdam. It has lot place of historical value surrounded around this. It's easy to locate and during summer the weather is awesome.Please ensure to walk around discover places which are of some historic value.